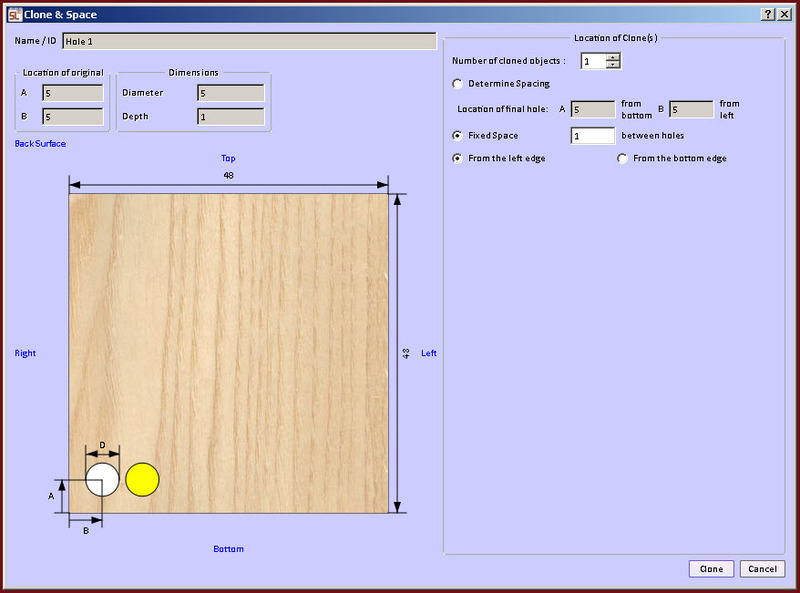 Cabinet Design - showing how to work with virtual boards. In your cabinet design details are important. Working at the board detail level provides the capabilities to add the kinds of effects that create unique, interesting, and specific designs for your use. For example at the board detail level you can take a piece of wood and put a 45° miter on both ends. Then you can cut a cove from the front of that board making it into a cold molding you might install that the top of the cabinet. Repeating the process two more times of allows you to wrap that cove molding around both sides in the front of your design. Other types of detail are joinery and holes. This lesson will show you how to apply all of these features to your design. Definition Board level detail is the lowest level in the SketchList 3D project structure. Board level details bring realism into your designs. 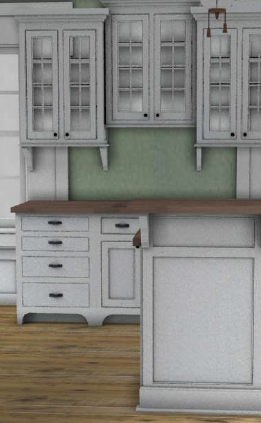 The attention to detail on the model of the kitchen shown above is proof of that. The various shapes, contours, corners, and other treatments allow this designer to achieve a significant degree of realism. In addition to that board level detail functions in a way that lets you address the actual fabrication of your piece. By adding joinery, holes, and various shapes to your design you can better replicate the construction techniques you use in the shop in your design. Different woodworkers have different attitudes and need for detail. Various situations also affect the amount of be goes into a cabinet design. If you are roughing out ideas or concepts you may not have any detail at all. If on the other hand you need to convince a prospective client to give you the job you may want to add much detail to better represent your ideas. Working at the board detail level requires you to be at the board level in the hierarchy of objects and containers. Board detail level is that below the board. There are two ways to get to the board detail level. Double-click at the board you want to detail. Select the board in an assembly, door, drawer or hardware and click the board details level line in the hierarchical level form. Select the board and click the details button in the board form. Basic concept 2 – Surfaces and edges. In SketchList every board created with to surfaces in four edges. Using the shaping tool you may actually increase the number of edges. For example if you take a rectangular board and change it to what an octagon the number of edges increases from 4 to 8. Edges and surfaces are detailed differently. Once you have selected a board and entered the board details level you click on the edge or surface you want to detail. It will highlight in green. The chart shows that the types of detail you can add to either surfaces or edges. After you select the board in the board details level pick a surface. You will notice that the buttons in the regions “board attributes on surface” and “board attributes on both edges and surfaces” become active. Click on the shape button. The shape tool will open. There are two areas in the shaping tool. The area to the right is the design area. The form on the left is the toolbox for shaping. If you click the top of that form you can drag it anywhere on the screen. 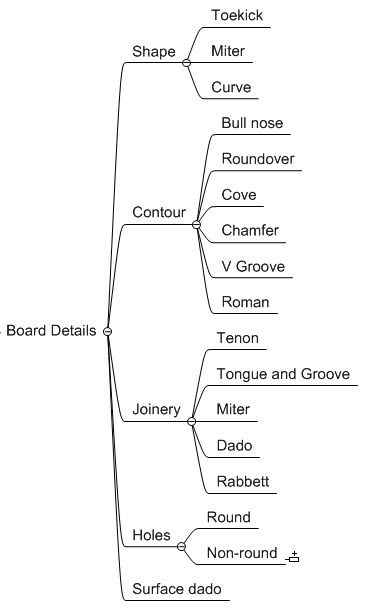 The basic idea behind the use of the shape tool is to add, locate, or delete points from the edges of the board. For example changing the board above from a rectangle and to a triangle, click the delete button in the toolkit and click one of the corners. There are tools for various types of shaping the tasks. Insert a point. Click this button move your mouse into any point on any edge on the board and click again to insert the point. Delete. Click the delete button and click the point you want to delete. In circle. Clicking the in-circle button turns the board into a circle. By taking the result of using the in-circle , deleting points, and using convert to line tool you can make something shapes. For example if you want a semi-circle at the end of a L shaped desk arm. In oval. Same as in circle except the output is an oval shape. Point fillet. Click this button and click a point at a corner on the design. Rounds the sharp corner. Convert to curve. Click this button and click an edge on the board. By dragging the two red dots that appear you can change the edge from straight to a curve. Convert to spline. Essentially the same as convert to curve but with more control over the detail of the resulting curve. Select. Click this button and pick a point. You notice once a point is selected the point properties portion of the toolbar expands to give you information about that point. Cancel. Returns board to the state. When you select a point on the curve the point property area of the toolbox provides more information about the characteristics of the curve. 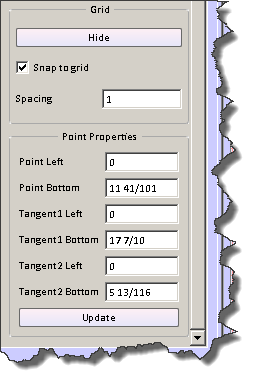 If you enter or change values in the point properties area click the update button to reflect those changes on the image of the board. When you finish shaping the board, click the exit shape button in the board form. At this point there is no arc function in SketchList 3D. SketchList 3-D allows you to “drill” holes in boards. Holes may be placed on surfaces or edges of a board. You can drill a hole all the way through the board, or you can make a whole less than the thickness of the board. An example of that would be a hole for a shelf pin or a mortise. Holes may not overlap. If you have the need to overlap holes you can simulate this on your design by having one whole approach another separated by a very small distance. Holes may also not cross the edge of a board. You may get a message indicating that the hole you’re creating does this. The workaround is to make the whole somewhat smaller or move it a bit from that edge. To drill hole, select the board the board detail level. Pick the surface on which the hole will be drilled. Click the non-rounded holes button or the holes button depending on the type of hole you want to place in the board. Non- Round hole – this is a square or rectangular hole form. You cannot make other than a four-sided a non-round hole. The parameters for a non-round hole are height, width, depth. 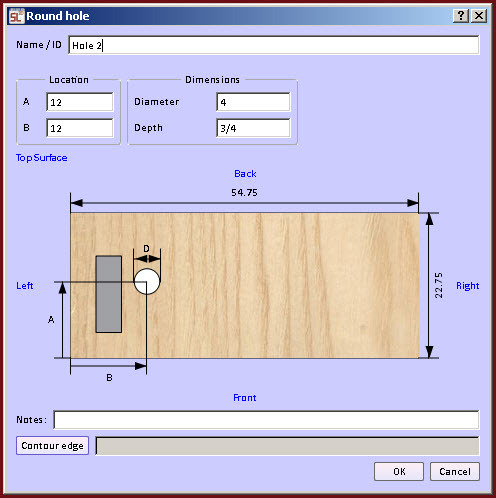 Round Hole – this is the round hole form. You cannot make other than a round hole. The parameters for a non-round hole are diameter and depth. Name the hole. SketchList 3-D will provide a default name but many times it useful for identifying the hole to have a named. For example you might name the hole shelf pin hole or lower dado . Fill in the location information. The A value is the distance from the bottom of the board to the hole for non-round holes in the distance from the bottom of the board to the center of a round hole. Fill in the dimensions of the hole. For a non-round hole you enter height, , width, depth. For round hole you enter diameter and depth. Optionally you can enter notes. You can change a hole where the board details level. Click the edit/clone holes button. Select the hole you want to edit and right click. When the sub menu opens you can select clone and space, edit, delete, or export. Export. Creates a spreadsheet like report of all the holes. You can print this or send it to a comma separated value file for importing to a spreadsheet or other software program. Clone and space allows you to make multiple copies of a hole and space them either a fixed distance apart or equally over a defined span. This is excellent for putting a series of shelf pin holes on the surface of a board. It can also be used for spacing dadoes or mortises. That covers the topic of entering holes in the a board. To add a contour to a board edge select the board that to contour and move to the board details level. 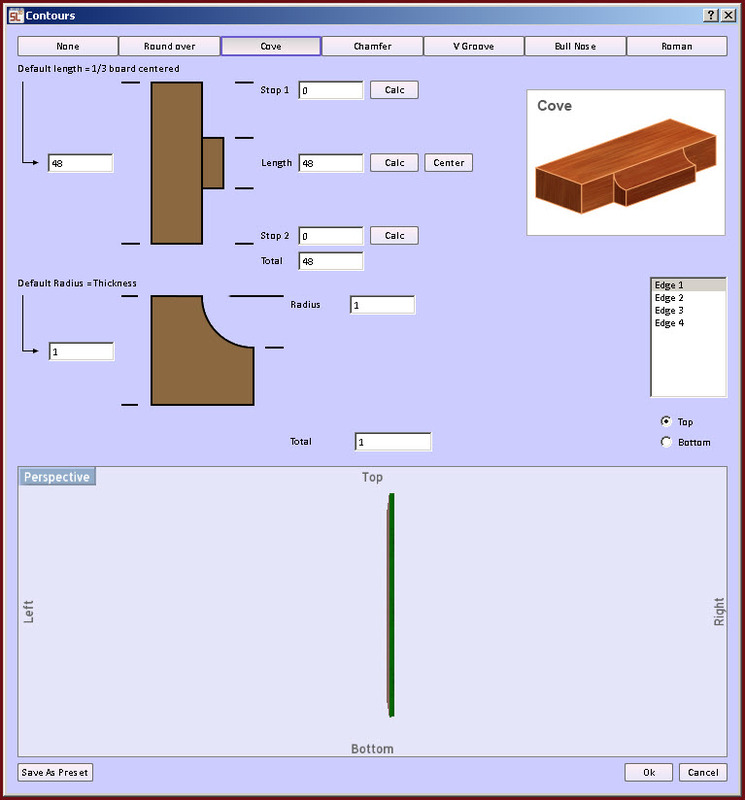 You can move to the boards detail level by double left clicking the board or after having selected the board click the board details level on the hierarchical level form. Double left mouse clicking is generally faster. 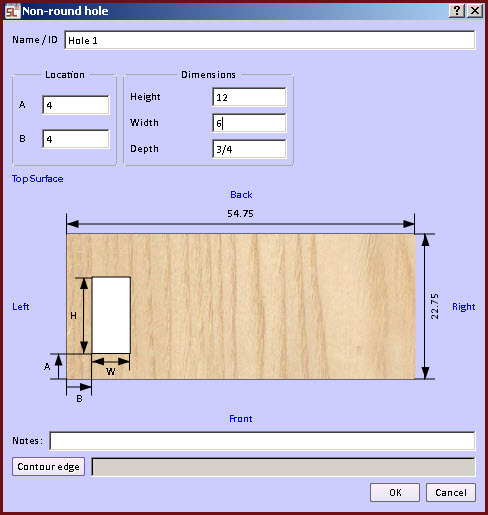 When you have a board selected and are in the board detail level click on the edge of the board you would to which you would like to apply the contour. Click the contour edge button. You can select one or all of the edges on the board by clicking those edges in the edge text box. They are labeled edge1 through edge n where n is the number of edges on a board. Select the contour type you want to apply by clicking its button the top of the form. A form will open. You can select the default contour or you can adjust the various elements that define the contour to create a contour of your own size. SketchList 3-D does not have the capacity to generate any contours shape. However if you experiment by adding different sizes to the components in the Roman contour type you’ll find that you have a fair amount of design flexibility. All contour forms share many similar elements. Of course the heart of the contour that makes it unique will be different from form to form. But the logic is consistent across every form. There are two views of the contour on a board. The profile of the contour from an end view. 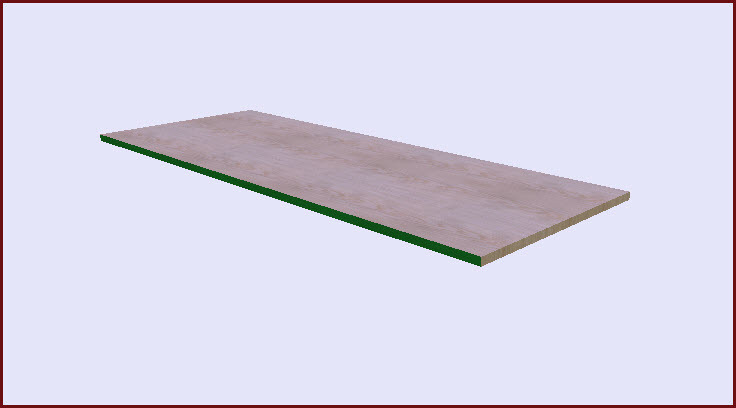 In this view SketchList 3D shows the thickness of the board. The layout the contour from the top or surface of you. In this view SketchList 3-D shows either the width or the length of the board depending on the edge selected. Each of the contours may be applied by accepting the default values. To do this simply click the OK button. For new design these defaults serve very well. There are times when you may need or want to have your own look place on the contour. For this you can modify the contours by changing the values in the contour form. There are three values to be entered for the top or surface view. When the form is opened the length value defaults to that of the board. If you want to make it smaller type in the new value where that value is less than the length of the board. At that point you can click the center button in SketchList 3-D will center a contour of that length on the board. Alternatively you can change the values as you desire for stop 1, length, or stop 2. The requirement is that the sum cannot be different than the total size of the board as indicated in the total text box. The number of values entered for the end view depend on the contour being cut. For the round over you enter the size of the radius. For the Cove you enter the size of the radius. For the chamfer you enter the number of degrees of the angle. For the V groove you enter the number of degrees of the angle. For the bull nose you can enter shoulder 1, radius, and or shoulder 2. Remember the sum must be equal to the total. The Roman contour is the most complex. It consists of two radii and two vertical distances. Those for use must equal the total thickness of the board.One interesting element of the Roman contour is the ability to extend the horizontal size of the second vertical. Making that horizontal size relatively long – say 1 inch – provides the ability to create the type of contour you might use for a five piece door.